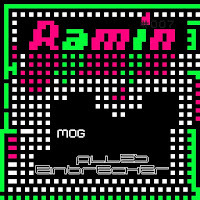 RAMIN TON: RTN007: Alles Einbrecher "MOG"
Alles Einbrecher is Pjtr Kaufmann & Ra Saite from OH NE joined by friend Smirra MC. Their simple intuitive writing, once drubbing, once drifting, always devoted to The Song, explores the features of perfect pop in the range of unworldly oddity. It is: Nice on Ice, Pjtr Kaufmann, Mc Smirra. Working on an EP. To be called "Frostschutzmittel Mama".